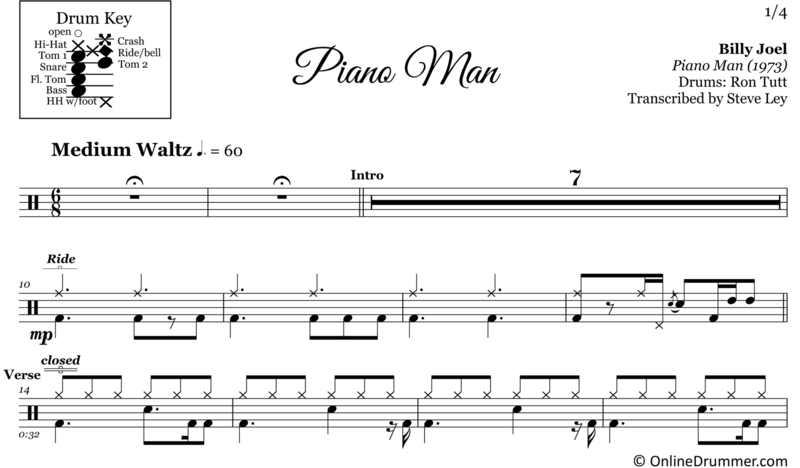 The full drum sheet music for “Piano Man” by Billy Joel from the album Piano Man (1973). Ron Tutt plays an incredibly articulate and dynamic drum track on the classic 70s hit, Piano Man, by Billy Joel. Tutt’s playing is sometimes overshadowed by the hook of the melody and catchy piano arrangement, but tuning into the drum part reveals an amazing performance — perhaps on par with the likes of Porcaro’s Rosanna. If your drumming isn’t quite at the level of Tutt or Porcaro, ignoring the ghost strokes throughout the song brings the difficulty level down a few notches while keeping the drum part fun to play and sounding great.